We carry the largest selection of stock tags made specifically for the meat packing industry. They include head, carcass, and curing. Our company also stocks sharp, semi-sharp, and blunt deadlocks. We stock two- and three-part head tags. The two-part head tags come with a white fiber patch and are numbered 000 to 999. 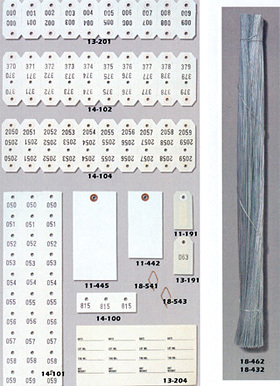 The three-part head tags are numbered 000 to 999 or 0000 to 9999. Some of these tags have white fiber patches and some do not. You can also special order a four-part head tag numbered 000 to 999 or 0000 to 9999 with or without patches. Our company carries a four-part unnumbered carcass tag. This tag has lines to note the "date", "lot number", "tag number" and "lot weight". We can custom make any head or carcass tag your company is currently using or would like to change to. This would include rolled head and carcass tags with any numbering sequence you desire. We get special requests daily. So, please note your tag specifications on the inquiry form. We will send you back a quotation within 24 hours. We have an unnumbered and numbered vulcanized fiber along with TYVEK® tags to meet your curing and tumbler tag needs. We also have numbered polypropylene poultry tags with a 23 gauge wire.